For his son, also a senator, see Robert M. La Follette Jr.. "Fighting Bob" redirects here. For other people called "Fighting Bob" see Robley D. Evans and Robert P. Shuler. For other uses see Robert La Follette (disambiguation). Robert La Follette was born on a farm in Primrose, Wisconsin, on June 14, 1855. He was the youngest of five children born to Josiah La Follette and Mary Ferguson, who had settled in Wisconsin in 1850. Josiah descended from French Huguenots, while Mary was of Scottish ancestry. Josiah died less than a year after Robert was born, and in 1862 Mary married John Saxton, a wealthy, seventy-year old merchant. La Follette's poor relationship with Saxton made for a difficult childhood. Though his mother was a Democrat, La Follette became, like most of his neighbors, a member of the Republican Party. La Follette began attending school at the age of four, though he often worked on the family farm. After Saxton died in 1872, La Follette, his mother, and his older sister moved to the nearby town of Madison. La Follette began attending the University of Wisconsin–Madison in 1875 and graduated in 1879. He was a mediocre student, but won a statewide oratory contest and established a student newspaper. He was deeply influenced by the university's president, John Bascom, on issues of morality, ethics, and social justice. During his time at the university, he became a vegetarian, declaring that his diet gave him more energy and a clear head. La Follette met Belle Case while attending the University of Wisconsin, and they married on December 31, 1881, at her family home in Baraboo, Wisconsin. She became a leader in the feminist movement, an advocate of women's suffrage and an important influence on the development of La Follette's ideas. La Follette was admitted to the state bar association in 1880. That same year, he won election as the district attorney for Dane County, Wisconsin, beginning a long career in politics. He became a protege of George E. Bryant, a wealthy Republican Party businessman and landowner from Madison. In 1884, he won election to the United States House of Representatives, becoming the youngest member of the subsequent 49th Congress. His political views were broadly in line with those of other Northern Republicans at the time; he supported high tariff rates and developed a strong relationship with William McKinley. He did, however, occasionally stray from the wishes of party leaders, as he voted for the Interstate Commerce Act of 1887 and the Sherman Antitrust Act of 1890. He also denounced racial discrimination in the Southern United States and favored the Lodge Bill, which would have provided federal protections against the mass disenfranchisement of African Americans in the South. At 35 years old, La Follette lost his seat in the 1890 Democratic landslide. Several factors contributed to his loss, including a compulsory-education bill passed by the Republican-controlled state legislature in 1889. Because the law required major subjects in schools to be taught in English, it contributed to a divide between the Catholic and Lutheran communities in Wisconsin. La Follette's support for the protective McKinley Tariff may have also played a role in his defeat. After the election, La Follette returned to Madison to begin a private law practice. According to his autobiography, La Follette experienced a political epiphany in 1891 after Senator Philetus Sawyer attempted to bribe him. La Follette claimed that Sawyer offered the bribe so that La Follette would influence his brother-in-law, Judge Robert G. Siebecker, who was presiding over a case involving state funds that Republican officials had allegedly embezzled. La Follette's public allegation of bribery precipitated a split with many friends and party leaders, though he continued to support Republican candidates like John Coit Spooner. He also strongly endorsed McKinley's run for president in the 1896 election, and he denounced Democratic presidential nominee William Jennings Bryan as a radical. Rather than bolting the party or retiring from politics, La Follette began building a coalition of dissatisfied Republicans, many of whom were relatively young and well-educated. Among his key allies were former governor William D. Hoard and Isaac Stephenson, the latter of whom published a pro-La Follette newspaper. La Follette's coalition also included many individuals from the state's large Scandinavian population, including Nils P. Haugen, Irvine Lenroot, and James O. Davidson. Beginning in 1894, La Follette's coalition focused on winning the office of Governor of Wisconsin. With La Follette serving as his campaign manager, Haugen sought the Republican nomination for governor in 1894, but he was defeated by William H. Upham. La Follette ran for the Republican gubernatorial nomination in 1896, but he was beaten by Edward Scofield; La Follette alleged that Scofield only won the nomination after conservative party leaders bribed some Republican delegates. La Follette declined to run as an independent despite the pleas of some supporters, and after the election he turned down an offer from President William McKinley to serve as the Comptroller of the Currency. In 1897, La Follette began advocating the replacement of party caucuses and conventions, the traditional method of partisan nominations for office, with primary elections, which allowed voters to directly choose party nominees. He also denounced the power of corporations, charging that they had taken control of the Republican Party. These progressive stances had become increasingly popular in the wake of the Panic of 1893, a severe economic downturn that caused many to reevaluate their political beliefs. La Follette ran for governor for the second time in 1898, but he was once again defeated by Scofield in the Republican primary. In 1900, La Follette made a third bid for governor, and he finally won the Republican nomination, in part because he reached an accommodation with many of the conservative party leaders. Running in a strong year for Republicans nationwide, La Follette decisively defeated his Democratic opponent in the general election, winning just under 60 percent of the vote. Upon taking office, La Follette called for an ambitious reform agenda, with his two top priorities being the implementation of primary elections and a reform of the state's tax system. La Follette initially hoped to work with the conservative faction of the Republican Party to pass these reforms, but conservatives and railroad interests broke with the governor. La Follette vetoed a primary election bill that would have applied only to local elections, while the state Senate voted to officially censure the governor after he attacked the legislature for failing to vote on his tax bill. Conservative party leaders attempted to deny La Follette renomination in 1902, but La Follette's energized supporters overcame the conservatives and took control of the state convention, implementing a progressive party platform. In the 1902 general election, La Follette decisively defeated the conservative Democratic nominee, Mayor David Stuart Rose of Milwaukee. In the aftermath of the 1902 election, the state legislature enacted the direct primary (subject to a statewide referendum) and La Follette's tax reform bill. The new tax law, which required railroads to pay taxes based on property owned rather than profits, resulted in railroads paying nearly double the amount of taxes they had paid before the enactment of the law. Having accomplished his first two major goals, La Follette next focused on regulating railroad rates, but the railroads prevented passage of his bill in 1903. During this period, La Follette became increasingly convinced of the need for a direct income tax in order to minimize tax avoidance by the wealthy. 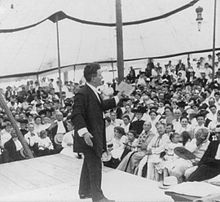 After the legislature adjourned in mid-1903, La Follette began lecturing on the Chautauqua circuit, delivering 57 speeches across the Midwest. He also earned the attention of muckraker journalists like Ray Stannard Baker and Lincoln Steffens, many of whom supported La Follette's progressive agenda. La Follette's continued movement towards progressivism alienated many Republican Party leaders, and La Follette's followers and conservative party leaders held separate conventions in 1904; ultimately the state supreme court declared that La Follette was the Republican Party's 1904 gubernatorial nominee. In the general election, La Follette won 51 percent of the vote, but he ran far behind Republican President Theodore Roosevelt, who took 63 percent of the state's vote. In that same election, Wisconsin voters approved the implementation of the direct primary. During the 1904 campaign, La Follette pledged that he would not resign as governor during his term, but after winning re-election he directed state representative Irvine Lenroot, a close political ally, to secure his election to the United States Senate. Shortly after La Follette delivered the inaugural message of his third term as governor, Lenroot began meeting with other legislators to assure that La Follette would be able to win election to the Senate; at that time, the state legislature elected senators. La Follette was formally nominated by the Republican caucus on January 23, 1905, and the state legislature chose him the following day. La Follette delayed accepting the nomination and continued to serve as governor until December 1905, when he announced that he would resign as governor. Throughout 1905, La Follette continued to push his progressive policies, including the state regulation of railroad rates. The state legislator passed a relatively weak regulation bill that La Follette considered vetoing, but he ultimately signed the law. Lieutenant Governor James O. Davidson succeeded La Follette as governor and went on to win re-election in 1906. La Follette immediately emerged as a progressive leader in the Senate. At first, he focused on a railroad regulation bill making its way through the Senate; he attacked the bill (eventually known as the Hepburn Act) as a watered-down compromise. He also began campaigning across the country, advocating for the election of progressive senators. Conservative party leaders, including Spooner and Nelson W. Aldrich, detested La Follette, viewing him as a dangerous demagogue. Hoping to deprive La Follette of as much influence as possible, Aldrich and his allies assigned La Follette to insignificant committees and loaded him down with routine work. Nonetheless, La Follette found ways to attack monopolistic coal companies, and he pressed for an expansion of the railroad regulation powers of the Interstate Commerce Committee. With the help of sympathetic journalists, La Follette also led the passage of the 1907 Railway Hours Act, which prohibited railroad workers from working for more than sixteen consecutive hours. Though he initially enjoyed warm relations with President Roosevelt, La Follette soured somewhat on the president after Roosevelt declined to support some progressive measures. Meanwhile, La Follette alienated some of his supporters in Wisconsin by favoring Stephenson, his main donor, over Lenroot in an election to fill the seat of retiring Senator John Coit Spooner. After the Panic of 1907, La Follette strongly opposed the Aldrich–Vreeland Act, which would authorize the issuance of $500 million in bond-backed currency. He alleged that the panic had been engineered by the "Money Trust," a group of 97 large corporations that sought to use the panic to destroy competitors and force the government to prop up their businesses. La Follette was unable to prevent the passage of the bill, but his 19-hour speech, the longest filibuster in Senate history up to that point, proved popular throughout the country. Beginning with the 1908 presidential election, La Follette repeatedly sought election as President of the United States. La Follette hoped that the backing of influential journalists like Lincoln Steffens and William Randolph Hearst would convince Republican leaders to nominate him for president in 1908, but he was unable to build a strong base of support outside of Wisconsin. Though he entered the 1908 Republican National Convention with the backing of most Wisconsin delegates, no delegates outside of his home state backed his candidacy. At the start of the convention, Secretary of War William Howard Taft was President Roosevelt's preferred choice, but Taft was opposed by some conservatives in the party. La Follette hoped that he might emerge as the Republican presidential nominee after multiple ballots, but Taft won the nomination on the first ballot of the convention. La Follette was nonetheless pleased that the party platform called for a reduction of the tariff and that Taft indicated that he would emulate Roosevelt's support for progressive policies. Taft defeated William Jennings Bryan in the 1908 election, and several progressives were victorious in the concurrent congressional elections. In early 1909, La Follette launched La Follette's Weekly Magazine, which quickly achieved a circulation of well over 30,000. Along with Jonathan P. Dolliver, La Follette led a progressive faction of Republicans in the Senate that clashed with Aldrich over the reduction of tariff rates. Their fight for tariff reduction was motivated by a desire to lower prices for consumers, as they believed that the high rates of the 1897 Dingley Act unfairly protected large corporations from competition and thereby allowed those corporations to charge high prices. Despite a widespread desire among consumers for lower prices, and a party platform that called for tariff reduction, Aldrich and other party leaders put forward the Payne–Aldrich Tariff Act, which largely preserved the high tariff rates of the Dingley Act. With the support of President Taft, the Payne–Aldrich Tariff passed the Senate; all Republican senators except La Follette's group of progressives voted for the tariff. The progressives did, however, begin the process of proposing the Sixteenth Amendment, which would effectively allow the federal government to levy an income tax. In late 1909, Taft fired Louis Glavis, an official of the Department of the Interior who had alleged that Secretary of the Interior Richard A. Ballinger favored the illegal expansion of coal mining on government land in Alaska. The resulting Pinchot–Ballinger controversy pitted Ballinger and Taft against Gifford Pinchot, the head of the United States Forest Service and a close friend of Theodore Roosevelt. La Follette's progressives strongly criticized the Taft administration for its handling of the controversy and initiated a congressional investigation into the affair. La Follette's successful re-election campaign in early 1911 further bolstered his position as the leader of the progressive faction of the Republican Party. In consultation with sympathetic journalists and public officials, in January 1911 La Follette launched the National Progressive Republican League, an organization devoted to passing progressive laws such as primary elections, the direct election of U.S. senators, and referendums. La Follette hoped that the league would also form a base of support for a challenge against Taft for the 1912 Republican presidential nomination. The league won the endorsement of nine senators, sixteen congressmen, four governors, and well-known individuals like Pinchot and Louis Brandeis, but notably lacked the support of former President Roosevelt. Explaining his refusal to join the league, Roosevelt asserted that he viewed the organization as too radical, stating his "wish to follow in the path of Abraham Lincoln rather than in the path of John Brown and Wendell Phillips." By mid-1911, most progressives believed that the battle for the 1912 Republican nomination would be waged between La Follette and Taft, but La Follette himself feared that Roosevelt would jump into the race. Though his candidacy was bolstered by the popular appeal of his autobiography, many progressive leaders strongly criticized La Follette for focusing on the writing of the autobiography rather than on campaigning across the country. Roosevelt announced his candidacy for the Republican nomination in early 1912, but La Follette rejected the request of Pinchot and some other progressives leaders to drop out of the race and endorse the former president. In February 1912, La Follette delivered a disastrous speech shortly after learning that his daughter, Mary, would undergo surgery. Some of his opponents accused La Follette of having suffered a mental breakdown, and many progressive leaders shifted their support to Roosevelt. Nonetheless, La Follette continued to campaign, focusing his attacks on Roosevelt rather than Taft. La Follette hoped to rejuvenate his campaign with victories in the 1912 Republican primaries but was able to win in only Wisconsin and North Dakota. He continued to oppose Roosevelt at the 1912 Republican National Convention, which ultimately re-nominated Taft. Roosevelt's supporters bolted the Republican Party, established the Progressive Party, and nominated Roosevelt on a third party ticket, but La Follette continued to attack Roosevelt as a traitor to the progressive cause. He remained neutral in the three-way general election contest between Roosevelt, Taft, and the Democratic nominee, Woodrow Wilson. With the Republican Party split, Wilson emerged triumphant in the 1912 election. La Follette's conduct during the campaign destroyed his standing as the leader of progressive Republicans in the Senate, as many progressives believed that La Follette's refusal to work with Roosevelt had damaged the progressive cause and abetted Taft's re-nomination. La Follette initially hoped to work closely with the Wilson administration, but Wilson ultimately chose to rely on congressional Democrats to pass legislation. Nonetheless, La Follette was the lone Republican senator to vote for the Revenue Act of 1913, which lowered tariff rates and levied a federal income tax. La Follette, who wanted to use the income tax for the purpose of income redistribution, influenced the bill by calling for a higher surtax on those earning more than $100,000 per year. La Follette and his fellow progressives challenged Wilson's proposed Federal Reserve Act as being overly-friendly towards the banking establishment, but Wilson convinced Democrats to enact his bill. La Follette also clashed with Southern Democrats like James K. Vardaman, who directed the farm benefits of the Smith–Lever Act of 1914 away from African-Americans. In 1915, La Follette won passage of the Seamen's Act, which allowed sailors to quit their jobs at any port where cargo was unloaded; the bill also required passenger ships to include lifeboats. In the 1914 mid-term elections, La Follette and his progressive allies in Wisconsin suffered a major defeat when conservative railroad executive Emanuel L. Philipp won election as governor. La Follette fended off a primary challenge in 1916 and went on to decisively defeat his Democratic opponent in the general election, but Philipp also won re-election. By 1916, foreign policy had emerged as the key issue in the country, and La Follette strongly opposed American interventions in Latin America. After the outbreak of World War I in 1914, La Follette praised the Wilson administration's policy of neutrality, but he broke with the president as Wilson pursued policies favorable to the Allied Powers. La Follette denounced many of the administration's wartime policies, including the Selective Service Act of 1917 and the Espionage Act of 1917. In many people's eyes during 1917 and 1918, La Follette was a traitor to his country. :1 Theodore Roosevelt called him a "skunk who ought to be hanged" when he opposed the arming of American merchant ships. La Follette opposed United States entry into World War I. On April 4th, 1917, the day of the vote on a war declaration by the US Congress, La Follette in a debate before the US Senate said, "Stand firm against the war and the future will honor you. Collective homicide can not establish human rights. For our country to enter the European war would be treason to humanity." Eventually, the US Senate voted to support entry to the war 82-6, passing the House of Representatives 373-50 two days later. La Follette faced immediate pushback, including by the Wisconsin State Journal, whose editorial claimed La Follette to be acting on behalf of German interests. The newspaper said, "It reveals his position to be decidedly pro-German (and) un-American... It is nothing short of pathetic to witness a man like La Follette, whose many brave battles for democracy have endeared him to the hearts of hundreds of thousands of Americans, now lending himself to the encouragement of autocracy. And that is all it is". After the outbreak of the Russian Revolution, La Follette supported the Bolsheviks, whom he believed were "struggling to establish an industrial democracy." He denounced the Allied intervention in the Russian Civil War, which he thought stemmed from Wilson's desire to prevent the spread of socialism. During the First Red Scare, a post-war period in the United States marked by the widespread fear of socialism and anarchism, La Follette condemned the Palmer Raids, sought the repeal of the Espionage Act, and proposed amnesty for political prisoners like Eugene V. Debs. Along with a diverse array of progressive and conservative Republican senators, he helped prevent the U.S. from ratifying the Treaty of Versailles. La Follette believed that the League of Nations, a vital component of the Treaty of Versailles, was primarily designed to protect the dominant financial interests of the United States and the Allied Powers. La Follette retained influence in Wisconsin, and he led a progressive delegation to the 1920 Republican National Convention. Nationwide, however, the Republican Party had increasingly embraced conservatism, and La Follette was denounced as a Bolshevik when he called for the repeal of the 1920 Esch–Cummins Act. After the Republican Party nominated conservative Senator Warren G. Harding, La Follette explored a third-party presidential bid, though he ultimately did not seek the presidency because various progressive groups were unable to agree on a platform. After the 1920 presidential election, which was won by Harding, La Follette became part of a "farm bloc" of congressmen who sought federal farm loans, a reduction in tariff rates, and other policies designed to help farmers. He also resisted the tax cuts proposed by Secretary of the Treasury Andrew Mellon, and his opposition helped prevent Congress from cutting taxes as deeply as had been proposed by the secretary of the treasury. In 1922, La Follette decisively defeated a primary challenge from conservative allies of President Harding, and he went on to win re-election with 83 percent of the vote. Nationwide, the elections saw the defeat of many conservative Republicans, leaving La Follette and his allies with control of the balance of power in Congress. After the Supreme Court struck down a federal child labor law, La Follette became increasingly critical of the Court, and he proposed an amendment that would allow Congress to repass any law declared unconstitutional. La Follette also began investigations into the Harding administration, and his efforts ultimately helped result in the unearthing of the Teapot Dome scandal. Harding died in August 1923 and was succeeded by Vice President Calvin Coolidge, who was firmly in the conservative wing of the Republican Party. By 1924, conservatives were ascendant in both major parties. In 1923, La Follette began planning for a third party run for the presidency, sending his allies to various states to build up a base of support and ensure ballot access. In early 1924, a group of labor unions, socialists, and farm groups, inspired by the success of Britain's Labour Party, established the Conference for Progressive Political Action (CPPA) as an umbrella organization of left-wing groups. Aside from labor unions and farm groups, the CPPA also included groups representing African-Americans, women, and college voters. The CPPA scheduled a national convention to nominate a candidate for president in July 1924. In early 1924, La Follette disavowed the support of Communists. He had changed his previous pro-Bolshevik stance after visiting the Soviet Union in 1923, where he had seen the impact of Communism on civil liberties and political rights. With other left-wing groups supporting La Follette, the Communist Party nominated its first ever candidate for president, William Z. Foster. On July 3, 1924, one day before the CPPA convention, La Follette announced his candidacy in the 1924 presidential election, stating that "to break the combined power of the private monopoly system over the political and economic life of the American people is the one paramount issue." The CPPA convention, which was dominated by supporters of La Follette, quickly endorsed La Follette for president. La Follette's first choice for his running mate, Associate Justice Louis Brandeis, refused to join the campaign. The convention instead nominated Senator Burton K. Wheeler of Montana, a progressive Democrat who had refused to endorse John W. Davis, the Democratic nominee for president. Though the Socialists pushed for a full slate of candidates, at La Follette's insistence, the CPPA did not establish a formal third party or field candidates for races other than the presidency. La Follette would appear on the ballot in every state except Louisiana, but his ticket was known by a variety of labels, including "Progressive," "Socialist," "Non-Partisan," and "Independent." After the convention, the Socialist Party of America, acting on the advice of perennial presidential candidate Eugene V. Debs, endorsed La Follette's candidacy. The American Federation of Labor and numerous other worker's groups also threw their support behind La Follette. Among the notable individuals who endorsed La Follette were birth control activist Margaret Sanger, African-American leader W. E. B. Du Bois, author Thorstein Veblen, and newspaper publisher E. W. Scripps. Harold L. Ickes and some other progressives who had supported Roosevelt's 1912 candidacy threw their backing behind La Follette, though other progressives, including Gifford Pinchot, endorsed Coolidge. Another group supporting La Follette was the Steuben Society, a group of German-Americans that claimed a membership of six million. 1924 presidential election results by county. Counties won by La Follette are marked green. La Follette's platform was based on many of the issues that he had been campaigning on throughout his political career. He called for government ownership of the railroads and electric utilities, cheap credit for farmers, the outlawing of child labor, stronger laws to help labor unions, more protection of civil liberties, an end to American imperialism in Latin America, and a referendum before any president could again lead the nation into war. Professional gamblers initially gave La Follette a 16-to-1 odds of winning, and many expected that his candidacy would force a contingent election in the House of Representatives. As election day approached, however, those hoping for a La Follette victory became more pessimistic. The various groups supporting La Follette often clashed, and his campaign was not nearly as well-financed as those of Davis and especially Coolidge. Corporate leaders, who saw in La Follette the specter of class warfare, mobilized against his third-party candidacy. Republicans campaigned on a "Coolidge or chaos" platform, arguing that the election of La Follette would severely disrupt economic growth. Having little fear of a Democratic victory, the Republican Party mainly focused its campaign attacks on La Follette. Ultimately, La Follette took 16.6 percent of the vote, while Coolidge won a majority of the popular and electoral vote. La Follette carried his home state of Wisconsin and finished second in eleven states, all of which were west of the Mississippi River. He performed best in rural areas and working-class urban areas, with much of his support coming from individuals affiliated with the Socialist Party. La Follette's 16.6% showing represents the third best popular vote showing for a third party since the American Civil War (after Roosevelt in 1912 and Ross Perot in 1992), while his winning of his home state represents the most recent occasion any third-party presidential candidate has carried a non-Southern state. The CPPA dissolved shortly after the election as various groups withdrew support. La Follette died of cardiovascular disease in Washington, D.C., on June 18, 1925. He was buried in the Forest Hill Cemetery on the near west side of Madison, Wisconsin. After his death, La Follette's wife, Belle Case La Follette, remained an influential figure and editor, watching their sons Philip and Robert enter politics. By the mid-1930s, the La Follettes had reformed the Progressive Party on the state level in the form of the Wisconsin Progressive Party. The party quickly, if briefly, became the dominant political power in the state, electing seven Progressive congressmen in 1934 and 1936. Their younger son, Philip La Follette, was elected Governor of Wisconsin, while their older son, Robert M. La Follette Jr., succeeded his father as senator. La Follette's daughter, Fola, was a prominent suffragette and labor activist and was married to the playwright George Middleton. A grandson, Bronson La Follette, served several terms as the Attorney General of Wisconsin and was the 1968 Democratic nominee for Governor of Wisconsin. La Follette has also influenced numerous other progressive politicians outside of Wisconsin, including Floyd B. Olson, Upton Sinclair, Fiorello La Guardia, and Wayne Morse. Senator and 2016 presidential candidate Bernie Sanders has frequently been compared to La Follette. In 1957, a Senate Committee selected La Follette as one of the five greatest U.S. Senators, along with Henry Clay, Daniel Webster, John C. Calhoun, and Robert A. Taft. A 1982 survey asking historians to rank the "ten greatest Senators in the nation's history" based on "accomplishments in office" and "long range impact on American history," placed La Follette first, tied with Henry Clay. Writing in 1998, historian John D. Buenker described La Follette as "the most celebrated figure in Wisconsin history." La Follette is represented by one of two statues from Wisconsin in the National Statuary Hall. An oval portrait of La Follette, painted by his cousin, Chester La Follette, also hangs in the Senate. The Robert M. La Follette House in Maple Bluff, Wisconsin, is a National Historic Landmark. Other things named for La Follette include La Follette High School in Madison and the Robert M. La Follette School of Public Affairs at the University of Wisconsin-Madison. ^ "Notable Vegetarians". The Literary Digest. May 24, 1913. Retrieved December 16, 2015. ^ Unger (2000), pp. 95-97. ^ Halford Ross Ryan (1988). Oratorical Encounters: Selected Studies and Sources of Twentieth Century Political Accusations. Westport, Connecticut: Greenwood Press, Inc.
^ "La Follette's speech in the U. S. Senate against the entry of the United States into the World War, April 4, 1917 :: Turning Points in Wisconsin History". content.wisconsinhistory.org. Retrieved February 13, 2019. ^ "Bob La Follette's big mistake -- State Journal editorial from 100 years ago". madison.com. Retrieved February 13, 2019. ^ "LA FOLLETTE, Robert Marion - Biographical Information". bioguide.congress.gov. Retrieved January 15, 2019. ^ Dreier, Peter (April 11, 2011). "La Follette's Wisconsin Idea". Dissent Magazine. Retrieved October 9, 2018. ^ Feinman, Ronald L. (February 6, 2016). "Between Hillary and Bernie: Who's the Real Progressive?". History News Network. Retrieved October 9, 2018. ^ "Sewer socialism's heir". The Economist. April 9, 2016. Retrieved October 9, 2018. ^ "The "Famous Five"". United States Senate. Retrieved October 7, 2018. ^ David L. Porter, "America's Ten Greatest Senators." The Rating Game in American Politics: An Interdisciplinary Approach. New York: Irvington, 1987. Buenker, John D. (Autumn 1998). "Robert M. La Follette's Progressive Odyssey". The Wisconsin Magazine of History. 82 (1): 2–31. JSTOR 4636775. Margulies, Herbert (1997). "Robert M. La Follette as Presidential Aspirant: The First Campaign, 1908". The Wisconsin Magazine of History. 80 (4): 258–279. JSTOR 4636705. Margulies, Herbert F. (1976). "Robert M. La Follette Goes to the Senate, 1905". The Wisconsin Magazine of History. 59 (3): 214–225. JSTOR 4635046. Shideler, James H. (1950). "The La Follette Progressive Party Campaign of 1924". The Wisconsin Magazine of History. 33 (4): 444–457. JSTOR 4632172. Unger, Nancy C. (2000). Fighting Bob La Follette: The Righteous Reformer. The University of North Carolina Press. ISBN 978-0807825457. Burgchardt, Carl R., Robert M. La Follette, Sr.: The Voice of Conscience Greenwood Press. 1992; on his oratory, with selected speeches. Garraty, John A., "Robert La Follette: The Promise Unfulfilled" American Heritage (1962) 13(3): 76–79, 84–88. ISSN 0002-8738 article. Hale, William Bayard (June 1911). "La Follette, Pioneer Progressive: The Story of "Fighting Bob", The New Master Of The Senate And Candidate For The Presidency". The World's Work: A History of Our Time. XXII: 14591–14600. Retrieved July 10, 2009. Scroop, Daniel. "A Life in Progress: Motion and Emotion in the Autobiography of Robert M. La Follette," American Nineteenth Century History (March 2012) 13#1 pp 45–64. Thelen, David Paul, The Early Life of Robert M. La Follette, 1855–1884. (1966). Brøndal, Jørn, Ethnic Leadership and Midwestern Politics: Scandinavian Americans and the Progressive Movement in Wisconsin, 1890–1914. (2004), on his ties with Scandinavian-American leaders. Buenker, John D., The History of Wisconsin. Volume IV The Progressive Era, 1893–1914 (1998), detailed narrative and analysis. Buhle, Mary Jo; Buhle, Paul; Kaye, Harvey J., eds. (1994). The American Radical. Routledge. ISBN 978-0415908047.
Cooper, Jr., John Milton (2004). "Why Wisconsin? The Badger State in the Progressive Era". The Wisconsin Magazine of History. 87 (3): 14–25. JSTOR 4637084. Margulies, Herbert F., The Decline of the Progressive Movement in Wisconsin, 1890–1920 (1968), detailed narrative. Maxwell, Robert S. La Follette and the Rise of the Progressives in Wisconsin. Madison, Wis.: State Historical Society of Wisconsin, 1956. Miller, Karen A. J., Populist Nationalism: Republican Insurgency and American Foreign Policy Making, 1918–1925 Greenwood Press, 1999. Wolraich, Michael (2014). Unreasonable Men: Theodore Roosevelt and the Republican Rebels Who Created Progressive Politics. St. Martin's Press. ISBN 9781137438089. La Follette's autobiography, a personal narrative of political experiences, 1913. Wikimedia Commons has media related to Robert M. La Follette, Sr..
United States Congress. "Robert M. La Follette (id: L000004)". Biographical Directory of the United States Congress. "La Follette, Robert Marion" . Encyclopædia Britannica (12th ed.). 1922. "La Follette, Robert Marion" . Collier's New Encyclopedia. 1921. "La Follette, Robert Marion" . Encyclopedia Americana. 1920. "La Follette, Robert Marion" . New International Encyclopedia. 1905. This page was last edited on 22 March 2019, at 00:13 (UTC).